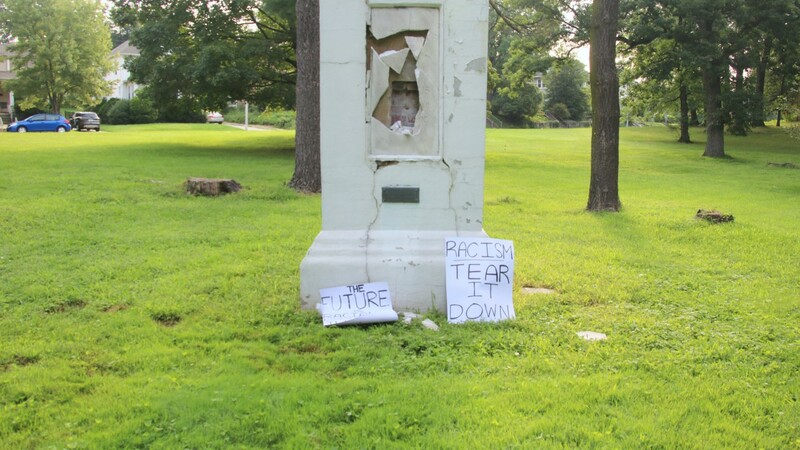 Someone took a sledgehammer to Baltimore's 200-yr-old monument to Christopher Columbus early this morning. Breitbart staffer says if Trump moves left, "We’re prepared to help Paul Ryan rally votes for impeachment." Impeachment on what? Moving left? Julio - does Columbus technically count as a "founder?" Globalists are getting exactly what they wanted. All the while liberals had no clue. Secret Service out of money to pay agents because of trump's frequent (constant) trips. Also reportedly treats them like servants & they're fed up. But who's surprised? Source: "Clinton treated USSS agents like friends. Bush treated them w great respect. Obama, like family. Trump treats them like servants." he is a terrible human being. A) "Source" ... Huffington Post ... okay. Not sure how you can even compare the article on Obama to what Super posted about Trump. Not meant as a comparison. Rather an illustration of how the trite 'treatment of the Secret Service' angle is used as a unsubtle and baseless means of character attack on virtually every candidate, and that there's always two sides to it (hence the HRC denial link via Politico). Last edited by Hawk; 08-21-2017 at 12:22 PM. Always costly in manpower and equipment, the president's jaunts to Mar-a-Lago are estimated to cost at least $3 million each, based on a General Accounting Office estimate for similar travel by former President Obama. The Secret Service has spent some $60,000 on golf cart rentals alone this year to protect Trump at both Mar-a-Lago and Bedminster. The president, First Lady Melania Trump and the couple's youngest son Barron – who maintained a separate detail in Trump Tower until June – aren't the only ones on the move with full-time security details in tow. Trump's other sons, Trump Organization executives Donald Jr. and Eric, based in New York, also are covered by security details, including when they travel frequently to promote Trump-branded properties in other countries. A few examples: Earlier this year, Eric Trump's business travel to Uruguay cost the Secret Service nearly $100,000 just for hotel rooms. Other trips included the United Kingdom and the Dominican Republic. In February, both sons and their security details traveled to Vancouver, British Columbia, for the opening of new Trump hotel there, and to Dubai to officially open a Trump International Golf Club. Perhaps I'm just peeved because I had to see places like Breitbart spouting fake news articles of Grandma Robinson getting a "$110,000" government salary and lifetime pension, but I haven't seen them post about this. Hawk, is this source allowed ? Fox News viewers very alarmed by reports that there's a black out in the sky. "There was obstruction of the sun on both sides. On both sides." remember: only 99% of scientists say it's a problem to stare directly into the eclipse. So it's an open debate. When I start posting **** from Breitbart or InfoWars or Fox News I hope you have the decency to save me from myself. Last edited by Hawk; 08-21-2017 at 01:06 PM. To be honest, I don't know who Grandma Robinson is. Those numbers RE: Trump and his family's SS expenditures bother me, and I'd like to research them more before arriving at the conclusion that Trump is a "terrible person". Does that report demonstrate editorial bias? @AP: BREAKING: Federal prosecutors: Man arrested after attempting to plant explosives at Confederate statue in Houston park. @sturg33 - I think we need terrorism defined here. This was so predictable. The left is far more violent than the right. Michelle Obama's mother. Barack's mother in-law. I think it's pretty crazy if he's charging them full price to rent rooms at his resorts and hotels as well as charging them for golf carts that they use when they are on the course protecting him. At the very least he should be putting the golf carts on the house.